Real estate mogul receives more than 32% of the votes in South Carolina. Rubio narrowly beats Cruz for second place. 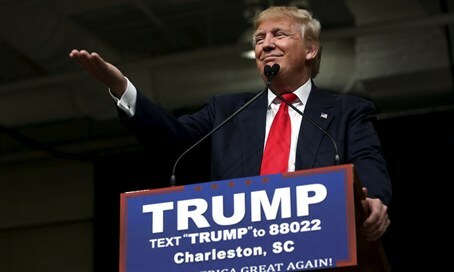 Donald Trump has won the South Carolina primary, Politico reported Saturday night, giving the real estate mogul his second consecutive win and helping seal his status as the Republican front-runner. With 100% of precincts reporting, Trump leads the first-in-the-south primary with more than 32 percent of the vote. A poll released earlier this week gave Trump a broad 16-point lead among those likely to vote in the state. Marco Rubio, who last week won the backing of South Carolina Governor Nikki Haley, narrowly beat Texas Senator Ted Cruz by two-tenths of a percent, 22.5 to 22.3. Trump’s second straight victory adds to his momentum heading into Super Tuesday on March 1, when 12 states vote, many of them in the south. The real estate mogul is quickly positioning himself as the candidate to beat in what may still be a long nomination fight, noted Politico. Former Florida Governor Jeb Bush came in a disappointing distant fourth place, with less than 8 percent of the vote. The Palmetto State was considered to be a do-or-die for Bush, and his failure to reach double digits effectively marked the end of his campaign. Bush suspended his campaign following Satuday's vote, ending his run for the White House. Ben Carson's campaign insists the former brain surgeon will remain in the race despite finishing in sixth place with 7 percent, behind Bush and Ohio Governor John Kasich. Trump’s victory in South Carolina came shortly after it was announced that Hillary Clinton won the Nevada caucus over Bernie Sanders. Next week, the two parties will flip locations, with the Republicans holding their Nevada primary Tuesday, and the Democrats holding their South Carolina primary next Saturday.